Content fuels any social media network and lies at the core of any digital transformation strategy. 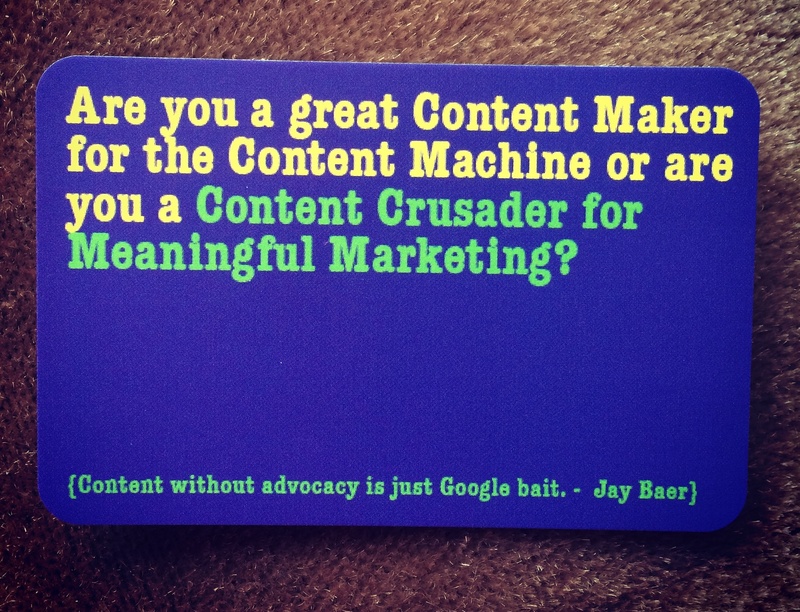 But do you know what’s at the heart of content? Ask yourself: are you trying to master content creation and marketing to be an expert content maker and marketer, or are you trying to be a better customer-oriented business because of it? Reprogramme the Content Machine with the following objectives: Sell less, educate more. Give help, not hype. Talk to customers human-to-human. By transforming into the trusted source of information that’s useful, relevant, and memorable, people will start to turn to you for answers. By becoming the leading content authority in your niche, you are naturally positioning yourself as the best provider of the solutions they seek. My framework is simple: Your strategy for winning shouldn’t be based on how much content you can produce. Efficiency in content production is secondary to relevance and utility of content. There’s nothing more inefficient than efficiently creating content which should not be made at all. Prioritise the development of content that educates and elevates because it creates more value for people and will thus drive more conversion to business. Focusing on content that helps people make better decisions is what will elevate you into a Content Authority and will distinguish you from the rest of the content makers. Consider this: if you can only spend on one piece of content, what would it be? I’d say, focus on the Problem-Solution type. It’s rooted in people’s needs and therefore, relevant and authentic. Greater Authenticity + Greater Relevance = Better Conversion Chances. The next challenge is to know what kind of content to make — as well as the scope and scale of production and distribution. This requires a deep understanding of the problems and desires of our audience. How can I make a difference for you? I will harmonise the three major elements of a Content Crusader Programme to enable you to create content that solves, saves, and sells: customer personas, content zone of authority, and content offerings for each phase of your customer’s decision-making journey. In doing so, your business gets to prioritise the basic set of content that moves people from solutions-unaware to committed-to-action. If we put in the work and stay focused, they’ll make their next move with us. I’m just a small business owner. A content programme sounds too big for me… You need, perhaps even more than big business, laser-sharp focus in the choices you make in marketing. You cannot win the content mass production game, but you can claim your niche. A Content Crusader Programme can be instrumental in securing your Content Zone of Authority by guiding the development of your Minimum Viable Content — the best content you can make that’s good for business and useful for your audience within the limited resources you have. With the Content Crusader Programme, you don’t have to settle for less — you don’t skimp on the strategic solution because what we will scale is the approach. I won’t stop at just helping you create meaningful content for discovery and optimisation. I’ll also set up a content strategy and system that matches your organisational capacities and supports your development as a content authority in your niche. There are many ways I can help you. Let me show you how. If you could only choose to make one piece of content, what would it be and why? Which content can you develop that will educate and elevate your target audience?